These healthy Apricot Bliss Balls make a great snack for the whole family! Our entire family loves dried apricots so you can always find a pack or two of them in our pantry. I decided to try this Apricot Bliss Ball recipe recently to mix things up, and to give the boys something a little different to this yummy two ingredient Apricot and Coconut Slice. This healthy Apricot Bliss Ball recipe only requires a few ingredients and takes no time at all to prepare, the longest part of the process is rolling the mixture into balls! This recipe will make around 24 Apricot Bliss Balls, however you can roll them smaller (use a teaspoon to scoop up the mixture) if you are wanting the mixture to go further – they are the perfect party food recipe! As both my boys school and kindy are not nut free, I’m able to pop one of these Bliss Balls into their lunchboxes. However if your school is nut free, these also make a great afternoon snack for the kids and will help to satisfy their hunger until dinner time – well hopefully anyway! These Apricot Bliss Balls are also freezer friendly, so you can make a batch up in advance and then store them in the freezer until needed – this is also a great way to hide them from the kids (or other family members!) to stop them from eating them all at once!! If you and your family love Apricot and Coconut recipes too, you might also like to check out this Apricot, Coconut and Oat Slice recipe. This easy Apricot Bliss Ball recipe is the perfect snack, is great for parties and is also freezer friendly. Thermomix instructions also included. Place all of the ingredients into a food processor and use the pulse function to blitz the ingredients together until the mixture begins to clump together. If you are using a Thermomix, use the 2 second turbo function 4 - 5 times or until the mixture begins to stick together. 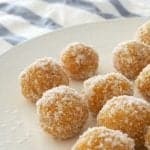 For more great snack recipes like these Apricot and Coconut Bliss Balls, make sure you check out our Tasty Tummies Healthy Snacks and Thermomix Lunchbox Snacks Books! Could these be rolled into logs instead of balls? I’ve got a little dude that LOVES apricot logs..